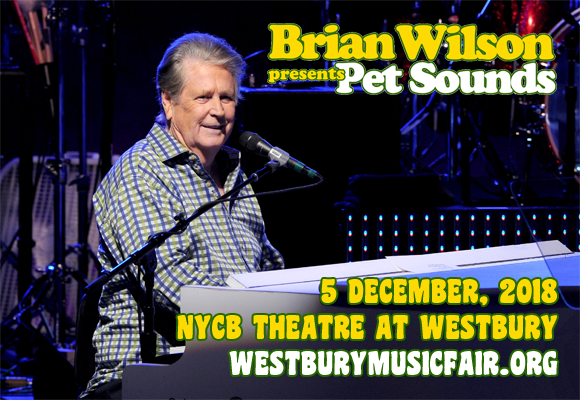 Coming to NYCB Theatre at Westbury on Wednesday 5th December 2018 as part of the worldwide Pet Sounds 50th Anniversary World Tour is co-founder of the Beach Boys and one of the most revered songwriters of all time Brian Wilson! Known as an incredible innovator, Wilson was responsible for the production, arrangement, and almost all of the composition of Pet Sounds, the Beach Boys 1966 album which is often hailed as one of the most influential records ever in terms of production. Now, the endlessly talented writer and performer will play the entirety of this hugely important album live! American musician, singer, songwriter, record producer and co-founder of the Beach Boys, Brian Wilson is noted by many as one of the greatest and most influential songwriters in the world. An innovator in the recording studio, Wilson was responsible for writing or co-writing over two-dozen Top 40 hits for the Beach Boys and was the first pop artist credited for writing, arranging, producing, and performing his own material. He was also responsible for originating the California Sound, which was responsible for influencing the creation of the "sunshine pop" and Flower Power music of the 1960s. In addition, Wilson was the first artist to use the recording studio as an instrument in its own right. He has been honored many times throughout his five-decade career – he was inducted into the Rock and Roll Hall of Fame alongside the Beach Boys in 1988, the Songwriters Hall of Fame in 2000 by Paul McCartney who referred to him as "one of the great American geniuses and the UK Music Hall of Fame in 2006 by Pink Floyd guitarist David Gilmour. He has been nominated for nine Grammy Awards, winning two. With the Beach Boys, Wilson released twenty nine studio albums, eight live albums, fifty five compilation albums, and seventy one singles, and he has released eleven albums as a solo artist.